Did you know that 1,500 water bottles are consumed in the U.S. per second? That's a lot of bottles. Once upon a time, at least once or twice a week my mom would buy a 12 pack of bottled water. We went through them like nothing, and at times I wouldn't even finish the bottle I took with me to school. When I did finish it, I would get thirsty throughout the day and buy another bottle of water from a vending machine, which cost me approximately $2.00 each time. Clearly, all this added up and cost my mom and me to spend unnecessarily. My dad never liked bottled water and would always say we were wasting our money when we had full access to tap water, fresh out of the sink. Well, guess what? He was right. Eventually, my mom decided to stop buying bottled water (it was just adding up to too much money) and bought a Brita Pitcher instead. This left me with a dilemma: How would I go about bringing water with me to school? I had relied so heavily on my mom's purchase of bottled water that for a least two weeks I went to school and came back parched. Sure, I bought a bottled water from the vending machine every day, but it was costly and where I once had two bottles of water, now I only had one. I decided to do some research of my own. What I found alarmed me: Not only is bottled water an unnecessary expense, but it's bad for the environment as well as hazardous to human health. Almost immediately afterward, I bought a portable Brita filtered water bottle and have been using it ever since. Water bottles contain toxins that can leach into your system with each sip you take. Two toxins found in water bottles have been DEHA, a possible human carcinogen, and benzyl butyl phthalate (BBP), a potential hormone disruptor. 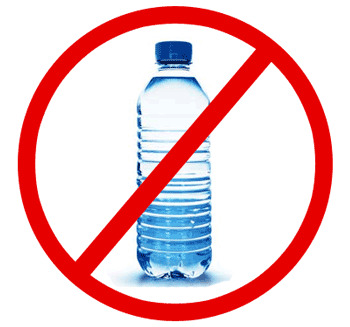 The risk of exposure to these chemicals increases the longer water bottles are left in the sun or left unattended. That sounds pretty bad, if you ask me. Not to mention that the water itself is probably re-bottled tap water, and can contain a host of icky things like mold, phthalates, microbes, trihalomethanes, benzene, and even arseni. Not convinced yet? Consider this: 1,500 water bottles are consumed per second in the U.S. Now just think about that in conjunction to the toxins found in water bottles I mentioned earlier: Does that create a better, healthier America? Worse yet, it hurts our environment: Every square mile of the ocean has over 46,000 pieces of floating plastic in it. This can kill sea life (they think the plastic is food and find out the deadly way their body can't digest it) as well as contribute to climate change. So please, if you're tired of spending money on something that's bad for your health and your world, make a change. Try using a Brita at home and a filtered water bottle when you're on the run. There are so many out there it can be hard to choose. Your best bet is probably stainless steel: That way there is no chance of any chemicals associated with plastic leaking into your bottle. Eventually, I'm going to transition to a filtered stainless steel water bottle too. But if you do decide to go with a reusable plastic water bottle, make sure it's BPA-free. I prefer filtered water bottles (because tap isn't always clean either), but there are a lot of beautiful glass, aluminum, plastic, and stainless steel reusable bottles without filters too. Choose one that feels right to you and meets your criteria: You won't regret it!